Deep in the heart of the Moltara Caves lies a pool of bubbling magma. Stationed at the entrance to the pool, if a pool can even have an entrance that is, stands a staunch Tonu, refusing admittance to all but a chosen few. But why would anybody want to take a dip in a pool so hot it could cook a whole raptraphant leg in 30 seconds? To make themselves look hot of course. I'm sorry, only those well-versed in the ways of Moltara are permitted to enter the Pool. Learn more and try again later. 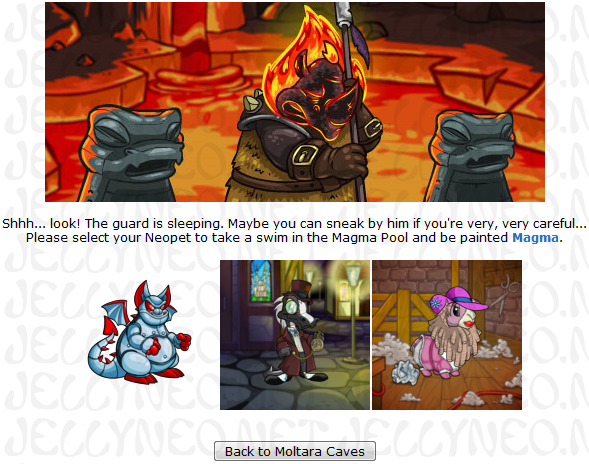 You may not earn the right to visit the Magma Pool on your side accounts, as this would also earn you Neopoints, but you are welcome to visit in hopes of sneaking past the sleeping guard, as there are no Neopoints rewarded for doing so. In certain situations, you may be granted access to the Magma Pool while the guard is awake, but we do not know the qualifications for this, aside from what TNT stated in the above editorial answer. Early data indicates that if you have completed other Moltara-related activities, such as asking Igneot for wisdom, reading Moltaran books and building petpets from Tangor's Workshop, you may have better chances of securing permanent access to the Magma Pool. If, however, that stuck-up chappy decides that you're not worthy of access, don't despair! It is possible to sneak by him and go for a dip, but doing so can take some work. There is a window of approximately ten minutes each day when the guard will fall asleep; the time is unique to your account but it will happen at the same time every day. So once you find it... WRITE. IT. DOWN! And there you have it, your very own little lump of lava to love. 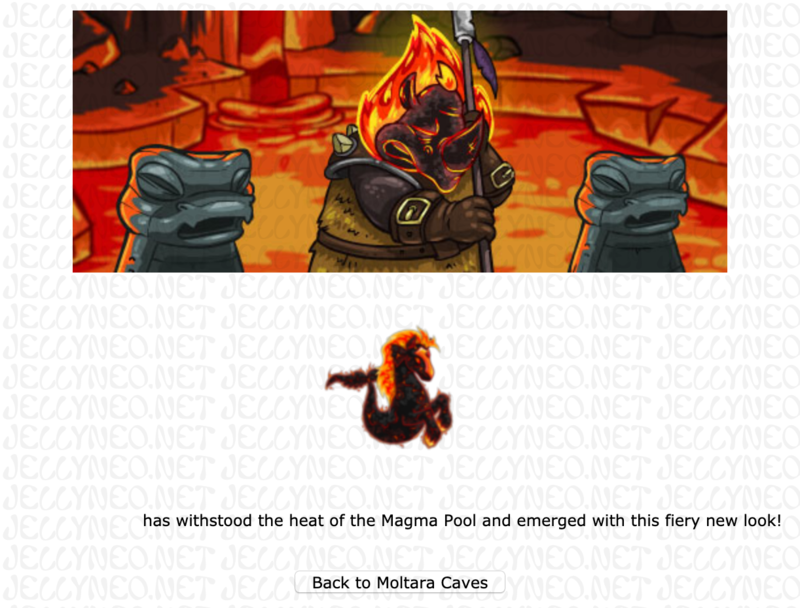 Once you have your personal time written down, you can go back to the Magma Pool as many times as you like and repaint your pets over and over. There is a waiting period after each use though; once you have painted a pet you will be locked out of the pool and will have to wait a week before you can use it again. If you have no luck at the Magma Pool and can't be bothered refreshing constantly, you could always hope for a lucky zap at the Lab Ray. Unfortunately, it is no longer possible to paint your pet Magma using a Fountain Faerie Quest; when the colour was first released it was possible to get a Magma pet via this method, but the option has since been removed to make it a bit more exclusive (thank you to kuruki_san for confirming this). Currently there are no Magma morphing potions and no Magma coloured paint brush. While it is extremely unlikely that TNT will ever release such items, there is always the possibility. Pounding a Magma pet will result in the pet being changed to the colour red. So don't go pound hunting thinking you will stumble upon a Magma pet. Using the safe pet transfer option, you can move the Magma painted pet to any account without it affecting the pet's colour. This page was last updated on July 10, 2018.